Facebook and Renren have no updates at all. The latest Renren page hasn't mentioned the finale of S2 yet. Contestants from S2 are still in the race according to the page. The only place that has updates is Sina Weibo.com. For spoiler pursuers & detectives Weibo is not indispensable, anyway. I reckon last season's spoilers were all from fans purely. Just read some spoilers. This will be a season you should never miss! CR3 contestants will reveal in 2 days! Do we have a start date yet? Season 3 of TAR: CR will be the last season produced by ICS. It doesn't preclude the possibility that other TV stations may pick it up someday, but I truly doubt it. The premiere will be at 23:50 on Aug 23rd on Dragon TV, and at 20:00 on Aug 26th on ICS. the 3rd season of The Amazing Race China Rush opening is released! Shanghai,Aug.15,2012 - Following the success of the first two seasons of The Amazing Race: China Rush, ICS and Dragon TV have once again teamed up this year to launch 12 all-new heart-racing episodes for their third season. Disney's internationally-renown reality show–The Amazing Race–has won 8 Primetime Emmy Awards, making it one of the most successful reality television shows of all time. The first two seasons of China Rush, China's only official version of the award-winning format, spawned a tidal-wave of new fans from audiences both home and abroad. Furthermore, China Rush Season One recently won a Highly Commended Award for BEST ADAPTATION OF AN EXISTING FORMAT at the Asian Television Awards. In addition to the same high-energy blend of travel, culture and dramatic challenges that the first two seasons offered, China Rush Season 3 has added an even more eye-catching line-up of locations and characters. This season has extended its race itinerary to include some of China's most unique and intriguing locations; including Taiwan, Jilin Province, Heilongjiang，Guizhou Province and many more. Teams will be racing in some of the most extreme climates and terrine that this vast nation has to offer. Season 3 also features 11 highly competitive teams of two hailing from across China and the world, racing for a trip around the world. This season's Chinese contestants, which make up more than half of the cast, are as diverse in personality as they are in the areas they come from. For example, one team of Liaoning Province cousins and street-side barbeque skewer salesmen used their one-of-a-kind style of singing and dancing while cooking to gain national fame on the second season of China's Got Talent. Now they've brought their unique talents to a different kind of reality competition to prove they are more than just“BBQ Boys”. A team of professional models from Taipei may look frail, but are full of surprises as they face their fears. Then there is the dating couple from Dalian, on a quest to show their parents and all of China that they have what it takes to bring their relationship to the next level. Like the Chinese teams, this season's foreign contestants are diverse, memorable and extremely determined. International contestants come from as far as Sweden, Malaysia, Australia, Canada, Scotland and the United States. One pair of former Harvard University roommates seem to be the full package, presenting themselves as the epitome of education, culture and athletics. Plus, a pair of fraternal twins from Penang, Malaysia make China Rush history as the first foreign team to use Mandarin as their primary language on the race. The brother and sister hope the adventure will be an opportunity to discover China and their Chinese roots for the first time; that is, if they can overcome their vastly different personalities. As with Season 2, China Rush Season 3 features two versions, a Chinese-language version and English-language version. The English version will broadcast with both Chinese and English subtitles at 20:00 every Sunday on ICS, starting August 26th; while the Chinese-language version will broadcast at 16:00 every Saturday on Dragon TV, starting September 1st. Both versions will once again be hosted by Chinese-American TV personality Allan Wu. In addition to government support on the local and national level, production of China Rush Season 3 is also supported by several international brands, such as Toyota and Hilton. For more details on The Amazing Race: China Rush please go to the official website www.chinarush.cn or weibo http://weibo.com/chinarush. Great news you two! Thanks for sharing! Have all the teams' individual pictures and bios been released? The third season of the China edition covers a wider range of regions than ever. So wide not even the Chinese participants know where they are. “The Amazing Race" is not just another game show in China. The Chinese consider it an ingenious means to show the "real China" to the outside world. "The show is not only promoting the local culture and customs but also the urban development achievement," said Ge Xiaowei (葛晓纬), one of the producers of the program's China edition, “The Amazing Race: China Rush” ("China Rush" in short). A copyright cooperation between Disney ABC and the International Channel of Shanghai (ICS), “China Rush” has just wrapped up production of the third season and is set to air from this month. According to the show’s production company ICS, season three covers a wider geographic range than the previous two seasons, spanning from the China-Russia border in the north to Yunnan Province in the south. Lei Sheng (雷声), a contestant hailing from Xi’an, said even the Chinese contenders had no clue where they were most of the time while on the road. “Being Chinese doesn’t give us any advantages,” said Lei, a 40-year-old outdoor experience trainer. In this season, 22 contestants (in 11 teams) from seven countries sweep through 11 cities all over China in 12 episodes, each lasting 48 minutes. The grand prize: a free round-the-world tour for two. The upcoming show was dubbed a multi-million renminbi production. But ICS didn’t disclose the exact production cost. It is also keeping its lips tight on the value of the champion’s prize. Ge Xiaowei said the program is a great offbeat tour guide to China. Having traveled with the team for one month to shoot the show, Ge said her most impressive destinations included Suifenhe (绥芬河), a city of 160,000 in Heilongjiang on the China-Russia border. Tasks in Suifenhe? Contestants were asked to complete a challenge involving traditional Russian dolls, revealed Ge. Based on the trailer, the new season also headed to places like the Miao ethnic group in Guizhou and China’s Korean autonomous prefecture Yanbian in Jilin Province. “This was a good chance to see a completely different side of a country that I haven’t seen before,” said contestant Nick Black. Black, 30, is a Shanghai-based sales executive from Scotland whose previous China travel experiences were limited to major Chinese cities. His most memorable moment of the show was walking off the plane in Heilongjiang at 2 a.m., frozen to death on an April day (“the temperature was like minus 3 or 4 C”). Rachel Chen, one half of the champion team in the first season, agrees that “China Rush” provides a unique way to travel the massive nation. The 27-year-old American-Chinese, who joined the show in 2010, said because the program worked with local tourism bureaus around the country, contestants could access places and take part in activities that normal travelers wouldn’t be able to. Nick Black noted that he’s come to find fun in traveling to an unknown place after the intense trip. “For some [travelers], before they come [to China], they’re not quite sure what the situation is. For example, if it’s gonna be safe,” said Nick. 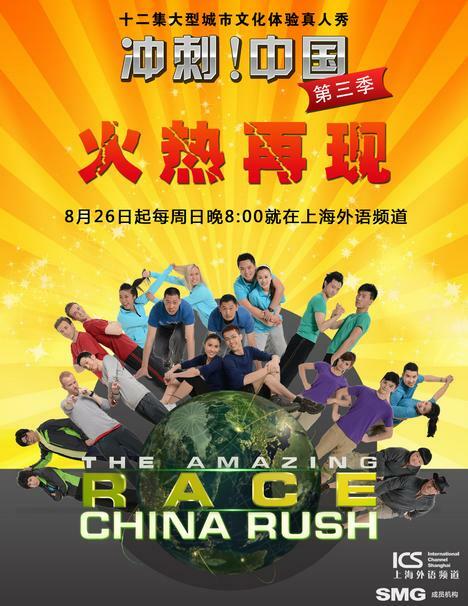 The English version of “The Amazing Race: China Rush” season three will premiere on August 26 on ICS at 8 p.m. (Beijing time). The Mandarin version will start screening on September 1 on international satellite channel Dragon TV at 4 p.m. Both versions air weekly. Or follow “China Rush” on its official website. Contestants are ready to hit the road for "The Amazing Race: China Rush" Season 3. "THE Amazing Race: China Rush" is off and running for an all-new third season of 12 heart-stopping episodes across China, including Taiwan. As with Season 2, Season 3 has a Chinese-language version and an English version, which has both Chinese and English subtitles. The English "China Rush" will be broadcast every Sunday at 8pm on ICS, starting on August 26. The Chinese version will be broadcast every Saturday at 4pm on Dragon TV, starting September 1. Both versions will once again be hosted by Chinese-American TV personality Allan Wu. After two successful seasons, ICS and Dragon TV teamed up once again to deliver China's official version of Disney's award-winning format. Season 3 provides the same high-energy blend of travel, culture and dramatic challenges that the first two seasons offered. The third version adds an even more compelling lineup of locations and characters. The race itinerary includes Taiwan, Jilin, Heilongjiang and Guizhou provinces, among many others. Teams will compete in extreme climates and terrain. The third season features 11 highly competitive teams of two persons from across China and other countries, all racing for a trip around the world. For example, one team of cousins from Liaoning Province are streetside barbecue vendors. They're the BBQ Boys who sang, danced and grilled in the second season of "China's Got Talent." Foreign contestants come from Australia, Canada, Malaysia, Scotland, Sweden and the United States. For more details, check www.chinarush.cn or weibo http://weibo.com/chinarush. This thread is for news and media ONLY please. No favs here. I was wondering why they used "China Rush 29" as the title of tonight's show. Seasons 1 and 2 both have 12 eps, so this must be ep "25", so why "29"?